The Board of Education voted 5-0 this week to build a new, small high school to prepare more students for college success and high paying, high-demand jobs. 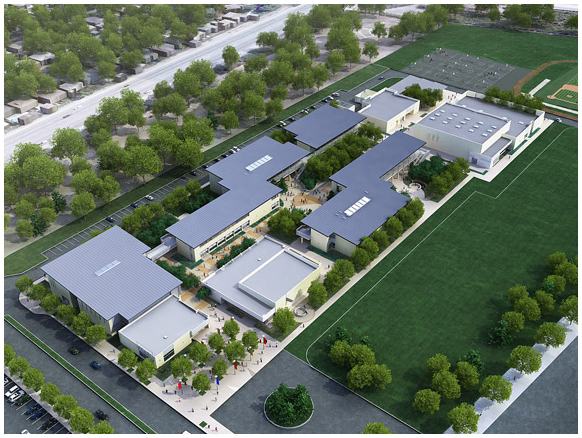 The school will occupy the existing DeMille Middle School site located at 7025 Parkcrest St. in East Long Beach. DeMille’s buildings will be replaced with a new Early College Academic and Technical School that is the first of several smaller, thematic high schools listed as priorities in the school district’s Facilities Master Plan. The districtwide facilities plan, developed after many meetings with parents and other neighborhood residents, calls for reducing the number of students at individual LBUSD high school campuses. Several high schools here enroll more than 4,500 students and are among the largest high schools in California. The unanimously approved smaller high school will enroll about 1,000 students, helping to alleviate pressure on existing high school campuses. Much like the school district’s California Academy of Mathematics and Science – ranked last month in U.S. News and World Report’s “America’s Best High Schools” as No. 4 in California and No. 22 in America – the new school will attract students from throughout LBUSD who choose to commit to a rigorous, intensive program. The project will cost more than $75 million, with funding provided by school construction and modernization bonds recently approved by local voters. The funds may only be used to build or upgrade schools and cannot be used for salaries or programs. The new school will serve students in 9th through 12th grades who wish to explore one of three areas of study – Health/Medical, Law Enforcement/Legal Services/Forensics, and Engineering. Students at the new school will take classes for early college credit as part of a partnership with Long Beach City College and Cal State Long Beach. The site’s location provides easy access to public transportation for traveling to these college courses. Students also will complete the A-G coursework required for admission to the California State University and University of California systems. LBUSD expects to have a waiting list for students to enroll. At its peak enrollment, the existing DeMille Middle School had served about 1,200 students, so the new high school will enroll fewer students than DeMille once did. A thorough study conducted in cooperation with the city’s traffic engineer shows that traffic on surrounding streets will improve with the new school, due to street improvements and ample on-campus parking and drop-off loops. Ingress and egress will be moved so that the residential area near the school will see far less school-related traffic. In addition, the buildings will be set back an ample 250 feet from Parkcrest Street, the main residential thoroughfare near the school. That’s about 180 feet farther from the street than the current school, creating a large green space and park-like atmosphere. Construction on the school may start this summer and conclude by fall 2012. Construction plans include many eco-friendly features such as high efficiency plumbing, lights and insulation, as well as solar power capability, storm water percolation to reduce irrigation needs, strategic window placement to take advantage of natural light, and recycling of 70 percent of construction and demolition debris.